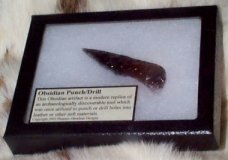 At the heart of Phoenix Obsidian Designs is the desire to assist in the study of, and disbursement of knowledge about, the ancient art of Flintknapping. Standard Educational Kits or Replications for Study are available with more options being developed. Always available are comparative collections of the debitage created during the manufacture of lithic artifacts using a variety of techniques. If you are working on putting together a comparative collection of lithic debitage, please CONTACT Dr. "Arizona" Gleason and she will be happy to assist you in any way possible. Remember that since these educational materials are manufactured once the order is received, there will be at least a month delay in the shipping. 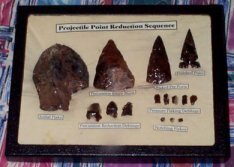 Educational items have been knapped by Dr. "Arizona" to help provide tools for the presentation of flintknapping to any age group. 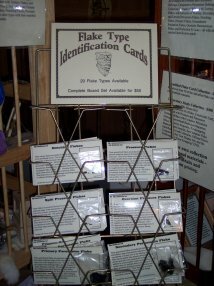 They are perfect for those teaching Introductory classes or even for use in Museum exhibits. Due to manufacturing, expect a month delay in shipping. The study of the 'debitage' (or 'trash') produced in the course of a flintknapping activity is at the heart of Lithic Analysis. The collections offered here can help train future lithic analysts, or beginning archaeologists, to recognize important attributes within the collections of debitage which they will uncover in the real world. Such collections can also serve as a powerful addition to the basic archaeological laboratory, assisting in the process of identification and interpretation. Due to manufacturing, expect a month delay in shipping. 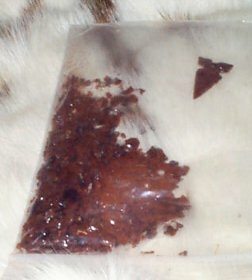 Here are offered specific flakes that can be seperated from collections of 'debitage' (or 'trash') produced in the course of a flintknapping activity. These are the flakes that need to be recognized within any Lithic Analysis and thus can help train future lithic analysts, or beginning archaeologists. Each flake comes with a identification card describing the specific attributes it shows. Collections of these identified flakes can serve as a powerful addition to the basic archaeological laboratory, assisting in the process of identification and interpretation. Due to manufacturing, expect a month delay in shipping. These are specific collection of items offered elsewhere on this site which can assist in teaching or learning about lithic technology. Great for use in the classroom, in an archaeological laboratory, at guest lectures or for museum exhibits. This allows for the most effective form of hands-on teaching without endangering actual archaeological collections. Due to manufacturing, expect a month delay in shipping. These items are replications of actual artifacts for use in the classroom, at guest lectures or for museum exhibits. This allows for the most effective form of hands-on teaching without endangering actual priceless artifacts. Use our Special Request Order Form (PDF, 57KB) to ask for a quote from Dr. "Arizona" in terms of replicating a specific artifact not currently shown on the TOOLS pages. Due to manufacturing, expect a month delay in shipping.